Hello. My wife and I will be in Amsterdam for two full days after a river cruise from Budapest to Amsterdam. We have early morning tickets at the 21st of August for the Anne Frank house and museum. We would then like to visit the Corrie ten Boom house. Is there public transportation close to the Anne Frank house that we can catch to get us there or do we have to got to the Central Station? We would go by train or bus at your recommendation. Thank you so much – Mike W.
From Anne Franks house it’s a short distance to go the Central Station Amsterdam. You need to go by train from Amsterdam CS to the Corrie ten Boom huse in Haarlem. That’s the best solution. The EYE filmmuseum has not been free for 2 years, please update your info! My husband and I will arrive in Holland 2 May and will leave 11 May. I’ve researched different museum/attraction cards and am thinking the Holland Medium Pass is best but would like your recommendation as it is a bit confusing. 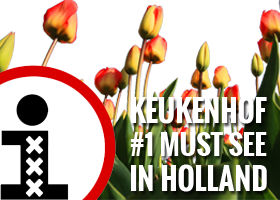 We want to visit Rijkesmuseum, Royal Delft Experience, Vermeer,Unnesco Kinderdijk, Heineken, Frans Hall,Van Gogh Museum, Marken Express, Keukenhof, Canal cruise, and Rembrandt House. MuseumKaart has been suggested by many but will be going outside Amsterdam so I’m thinking Holland Pass better. We will have the a TripKey so travel is not a consideration in choosing best option. Thinking gold pass for Rijkes, Van Gogh and silver for Keukenhof or canal cruise and Heineken. Will then use discount card for other attractions/museums. Can I buy discount tickets at a Tourist Information site or do I buy at each museum/attraction. If at each site, do I have to queue with others buying tickets? Your recommendation please. Many thanks. Museumkaart is also valid outside Amsterdam; it’s a national card. But you only get discounts at museums, not at any attraction like Heineken Experience, a Canal Cruise, Marken Express etc. So if you want to visit both museums and attractions we recommend the Amsterdam Holland Pass. Unfortunately the Amsterdam Holland Pass does not give access anymore to a fast track entrance. Amsterdam has become more and more popular during the last years that the largest museums can’t accept this anymore. So yiu have to stand in line like al other ticket holders. If you have used your GOLDEN & SILVER tickets you can use the Amsterdam Holland Pass for disocunts. These discounted tickets you have to buy at the museum/attraction itself. Enjoy our beautiful city within a few days! Please answer me ugrently becuase I’m in process of buying I am Amsterdam card. 1. If I buy card from Friday 21.4. and us it Saturdey 10:a.m. does cards start cout hours from Saturday 10.a.m. 2. If I use it AT Saturday 10:00 a.m. is that mean that is valid until Wednesday 10.00 a.m.
Do you know their telephone number or beter their WEB site ? I’ve sent you an email with the new name and contact details of the hotel.